Thrown into a group of teenagers who are total strangers? Whether you’re a teacher, coach or a teen trying to make new friends, these 30 icebreaker activities are sure to get students feeling more comfortable in a new situation. It’s easy for students to tune out or get bored sitting down, so keep everyone moving and engaged with these ideas. Blobs - First, draw a category from a hat (i.e. color). Then, have students race to see who can make a group of four to five the fastest based on a similarity within that category (i.e. they are all wearing blue). Line it Up - See how fast your group can get into an alphabetical line based on their names. Better yet, split into boys vs. girls or two randomly assigned groups and race to see which group can get organized first. Move if You… - Have students sit in a large circle with one person in the middle. The middle person calls out for a certain group of people to move — for example, “Move if you have brown hair” or “Move if you have been to another country.” If the students fit the criteria, they must run to a new seat in the circle. The one student left standing is in the middle for the next round. Play Catch - Have students stand in a large circle and play catch with a large beach ball. The trick? Write get-to-know-you questions all over the beach ball and whoever catches it must answer the question their hand rests on. Giant Jenga - Buy a giant Jenga set and put a question on each block! Every time a student pulls a block, they’ll answer a question — and there’s sure to be a lot of laughter as students try to keep the tower from tumbling down! Shuffle Your Buns - Make a circle of chairs with one empty seat. One person in the middle of the circle must try to sit down while the seated students all shift down, moving the empty seat down the line. The twist? Have someone call “switch” every so often, forcing the people in the circle to switch directions and shift the other way. If the middle person manages to sit in the empty seat, the person that was supposed to be moving into it is in the middle. Giant Knot - Create a shoulder-to-shoulder circle, and then have each student grab two other hands from two different people across the circle. Now the entire circle must figure out how to untangle the giant knot of arms and people without letting go. Race for the Truth - Have each person stand on the starting line while a leader lists off general facts. (For example, I have a dog.) If the stated fact is true for any of the students, those students must move forward a step. Whoever crosses the finish line first wins! 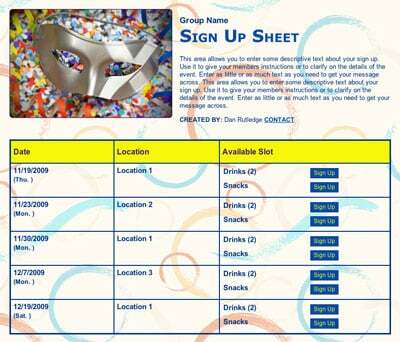 Organize school club volunteer opportunities with a sign up! SAMPLE. If you want to lead a discussion or learn more personal information about your students, try one of these games. This or That - As any parent will tell you, teenagers LOVE to argue. Ask silly would-you-rather questions and have your group move to different areas based on what they chose. Then, have them present their arguments and see if they can change the other students’ minds! You’re sure to have some funny moments. Pows and Wows - This is a great game to help a classroom or team of students build camaraderie. Have each person share one good thing and one bad thing from their day. It’s simple, but effective! Who Am I? - Put a notecard with the name of a well-known figure on each student’s back. Next, have the students walk around asking each other yes-or-no questions. First person to figure out who they are wins! Scars - This game is best in small groups. Have each student show a scar and explain how he got it. For instance, “I got this scar from a paper cut because I was using a paper sign up instead of SignUpGenius.” The students may have funny stories or they may have personal ones. Either way, you will all learn a lot about each other. Toilet Paper - Pass a roll of toilet paper around and tell each student to take as much as they would like. Then, after some students have taken a huge amount, reveal that for each piece of toilet paper they must say a fact about themselves! Autobiography - For groups that need to be close knit, like a sports team or a drama cast, have each person sum up their life in one sentence. It’s difficult — but you’ll learn a lot about your new friends! Candy Confessions - Buy colorful candy — like Skittles — and have each person take a handful. Then, unveil that for each color, they must reveal a different type of fact about themselves. For example, for each yellow Skittle, they must say a favorite food. For students who love art or are visual learners, these colorful ideas are sure to be a hit. Blindfolded Self-Portraits - Blindfold all the students and have them (attempt to) draw a self-portrait. Finally, take off the blindfolds and try to match the portraits to the people! Architect - Give the students a bunch of silly materials (paper, Post-it notes, strings, tape, wood, etc.) and then assign them to build small models of different objects in five-minute increments — an elephant, a car, etc. Pick a winner each time! Post-it Statues - Split your group into teams of five or six. Give each team Post-it notes. In five minutes, they must cover one person in the group as completely as possible with Post-it notes. Count which group got the most —then see who can get them all off the fastest. Bubble Gum Artist - Give each person two to three pieces of bubble gum to chew. Then give them an index card and a toothpick. They must then make a bubble gum art piece using just those things. Vote on which is the best! Facts About Me - Give each student a blank template of a person. Then, the leader gives the students instructions on how to draw on the self-portrait based on facts. For example, the leader might say, “If you have a dog, draw a green shirt.” At the end, shuffle the pictures and see if the students can match them to the correct person. Name Pictionary - Have students write their names by drawing pictures of objects that start with the correct letter. For example, someone with the name Ann would draw an apple, a nose and a nest. Then, have the group try to spell and guess each person’s name. Tattoo Parlor - Have each student draw a tattoo that they think accurately describes them or includes one of their favorite things. Then, pin the pictures up and try to match the “tattoos” with the people who drew them. Collect donations for a silent auction with an online sign up! SAMPLE. This list of memory, improvisation and on-the-spot games are sure to give your brains a workout. Assassin - One student stands in the middle of a circle. The students in the circle know that one person in the circle is the “assassin.” When the “assassin” sticks their tongue out at a student, that student must pretend to die dramatically. Amid the commotion, the middle person must figure out who the assassin is. Rock Star - Split your group into two teams. When it’s their turn, each team must grab a word from a bowl (words can be common ones such as rain, baby or sun) and try to sing as many songs using that word as they can. See how long they can go until they run out of songs using that word. Desert Island - Each person goes around the circle and says one thing they would take with them on a desert island. The next person must then name the items before them and add their own item on. Keep going until someone makes a mistake! Think Fast - Give students a few minutes and tell them to learn all the names they can. Then split the group into two teams. Have one student from each team stand on either side of a barrier (like a dark blanket or sheet). Make sure they can’t see each other, then without warning, drop the sheet. The first person to say the other’s name gets a point for their team! The Number Game - Have the students sit in a circle and attempt to count to 10. Explain that there is no set order or time for calling out the numbers. Anyone can call out the next number, BUT if they say the number at the same time as someone else, the group must start over. Once the group reaches 10, try to get to 20! Rainbow Categories - Have two students stand up. Let the group pick a category (like animals) and a color (like orange). The students must then alternate, trying to name orange animals for as long as possible until one hesitates. When one person stops, the other student wins. What’s Different? - Students all pair up and get 30 seconds to memorize everything about their partner’s appearance. When the time is called, they turn away from each other and change something (i.e. take off a headband or button another button). Which pair can identify each other’s changes the fastest? By using just a few of these icebreakers, you’re sure to have a close-knit group within minutes! Thank you so much for sharing your ideas!! These are great! Kayla, these are great. Thanks for caring and sharing. Keep up the good work!! These are great! Thank you for sharing your creativity, Kayla! Thank you for writing these up. Planning to use some of these for our youth meetings. 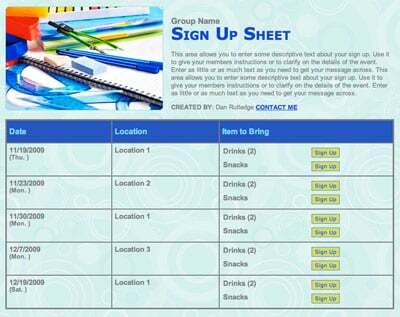 Set up a school carpool with an online sign up.